Last year, the highest-grossing anime of all time opened, but you may have missed it. That’s because it only played for a single week in the U.S. to qualify for the Oscars. It wasn’t even nominated—but hopefully come April 7, history will realize that was a mistake. The movie is called Your Name. It’s a Japanese animated film by director Makoto Shinkai and it’s absolutely incredible. The only reason I didn’t fight for it to be on our best of 2016 list is that I hadn’t had a chance to see it yet. But then I was on a random cross-country flight, and United Airlines had the film available for viewing as part of its international section. So I watched it, and found myself fighting tears of joy and sadness. I was stunned, wondering, how does this movie exist and I’m seeing it for the first time on a plane? At last, Your Name will finally get a U.S. release on April 7 thanks to Funimation Films, which just released an English dubbed trailer. It’s pretty similar to the original Japanese trailer, except in English, but I’m guessing most people haven’t seen it anyway. Don’t let the PG rating and upbeat pop song fool you. 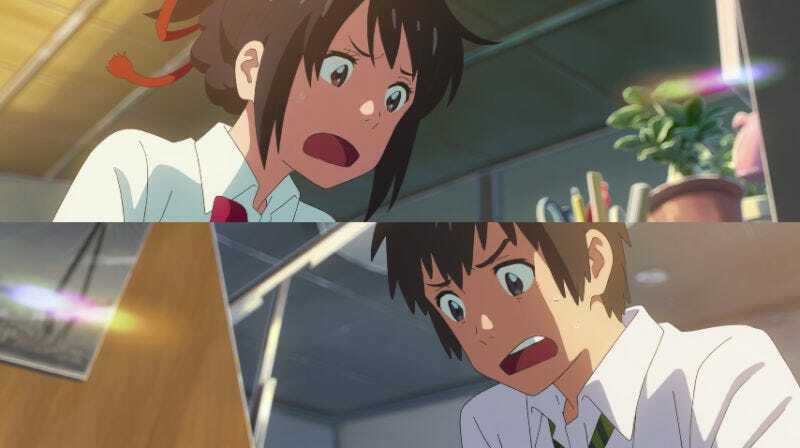 Your Name is not some simple movie. I think the trailer actually undercuts the movie a little, focusing on only one aspect of the film and bombarding you with the song. Yes, some of that is in there, but it’s used sparingly, and only at the perfect moment. This is a film that’s kind of impossible to grasp until you see it in its entirety. Not only are the story, characters, and animation truly wonderful, it’s got some very unique blending of genre and themes. The trailer shows that it’s a body-swapping movie and that’s how it starts. But it’s also a teen comedy, a drama, a disaster movie, a wondrous fantasy, a hero’s journey, and more. And it’s all wholly cohesive, surprising, and level-headed. The complex film is handled with a grace that’s rare in cinema. Watching it, even on a tiny plane monitor, is an experience I won’t soon forget. Funimation is opening Your Name both with an English dub and with English subtitles on April 7 and you can find more information here. Do that. See this one. You won’t be let down.